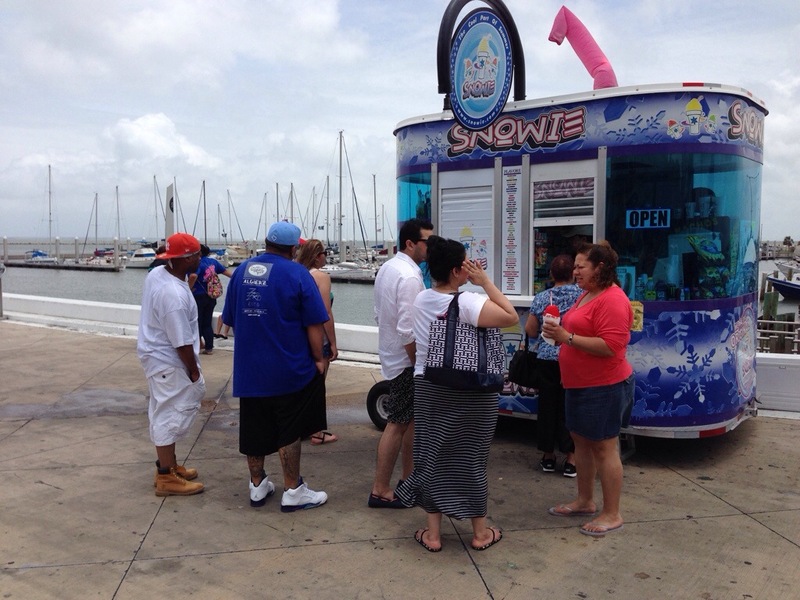 day 1 — You run on a course that passes a snow cone stand. 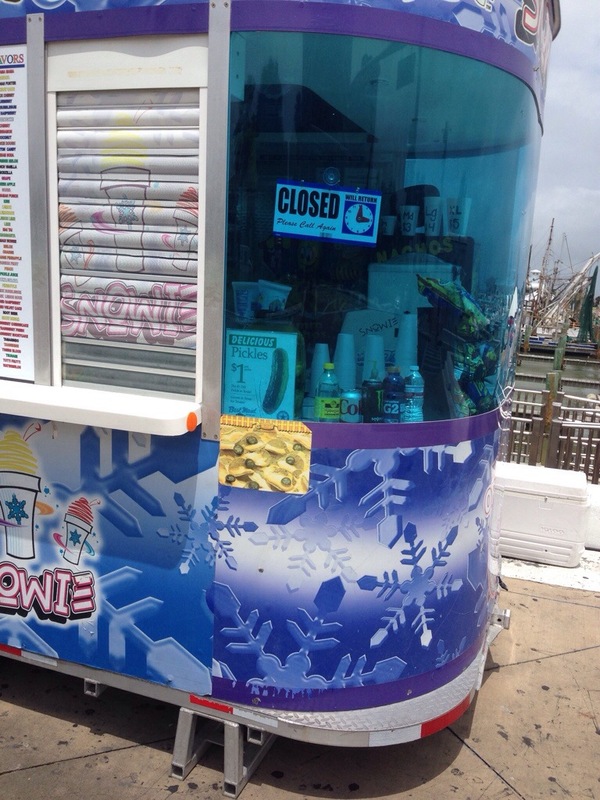 You think, “My, a snow cone would be delightful right about now. But not blue. That’s just creepy.” Sadly, you have depleted your Emergency Crazy Homeless Guy Fund on a guy playing a pretty good Stevie Ray (you’re almost certain it wasn’t actually him) along the course. You are sad. day 2 — You bring cash. Not enough for the $5 “Texas size” (which you suspect isn’t actually shaped like Texas anyhow), but enough for the medium. But not blue. That would just be creepy. The medium should still be plenty to drip all over yourself, causing a big red stain on the front of your singlet for crowd sympathy, and sticky fingers just right for handling the Garmin. And then: Everyone else in town gets in line just in front of you. Memorial Day, you know. Thwarted. You continue without. You are sad. day 3 — Memorial Day is over. The crowds are gone. You have the beach to yourself. You have cash. This is finally going to happen. Hot and tired, you arrive. To this. Oh, well. You probably would’ve gotten a blue one by mistake anyhow. Still. You are sad. Day 4 — You give up on the beach altogether. It’s just too hard to go by that damn stand every day. You run around the neighborhood instead. It’s hot. It’s not so much the heat, it’s the humidity. No, it’s not so much the heat or humidity, it’s the stupid alpaca beanie. Whose idea was that? Four miles and an aching knee later, you call it a day. Going into the apartment, you look hopefully in the pantry to see if Mo has a Gatorade stash. She does! And you know what? 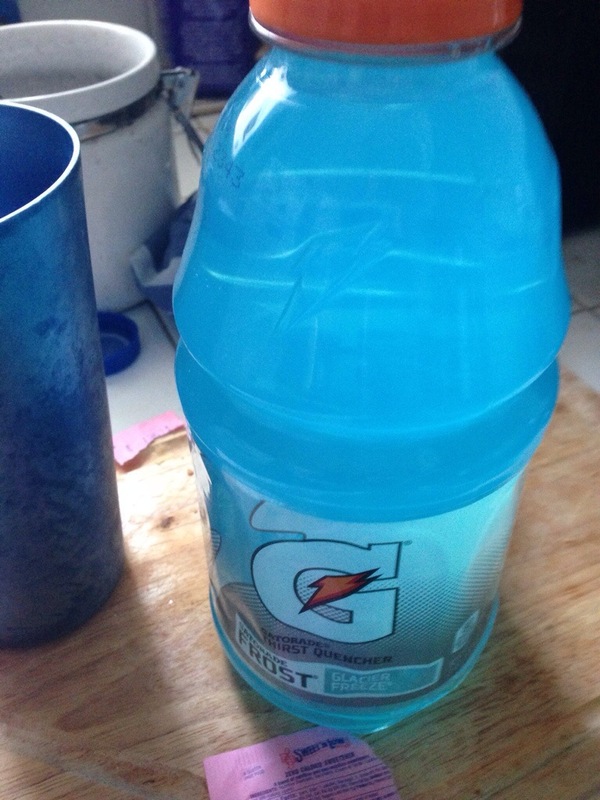 It’s pretty dang good, whatever flavor blue is. You are happy. This entry was posted in running and tagged life, roscoe the talking magpie, running. Bookmark the permalink. there really should be a support group. And don’t you hate it when they say “but what about blueberries?” It’s not even the same blue. just fill their blue gatorade bottle with Windex. Done and done. No jury would convict you. well, they probably would, but I doubt prisons serve blue food. Except maybe the baloney.